The easily mobilised, TC650 one person transport chamber provides for on-site recompression treatments and transport under pressure to larger treatment chambers. 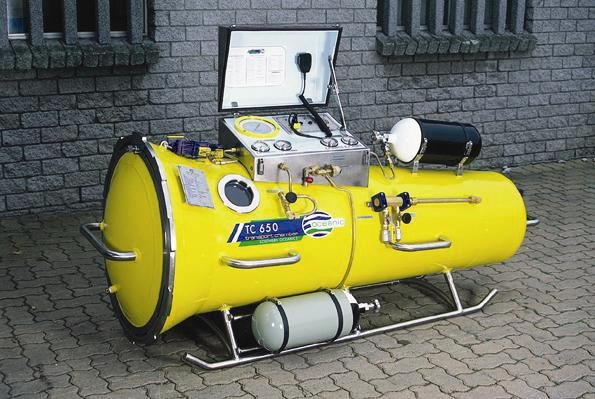 Lightweight, the duplex stainless steel TC650 transport chamber, or hyperbaric stretcher, is designed to support detached military diving operations. With a diver under pressure, it may be hand-carried by 6 or 8 people and is easily transported by boat, helicopter, small fixed-wing aircraft or light pick-up truck. An optional nonmagnetic version, the TC650 – MCM transport chamber, is also available for use aboard mine countermeasure vessels.